You can't declutter your whole house/life in one afternoon. (Or at least most people can't.) You didn't acquire all your stuff in one afternoon, so there's no way you can get it all done in a short time frame. 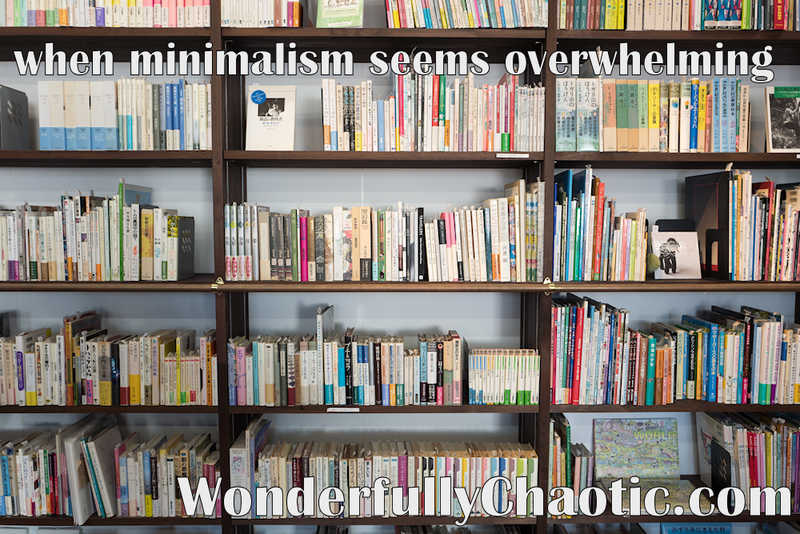 It also often requires cleaning, organizing, sorting, filing, and of course lots of decision-making. Minimalism is about decreasing the amount of "stuff" in your house but sometimes it's also about the "stuff" in your life. Getting rid of items has inspired me to also get rid of other "stuff" - an overstuffed email inbox, things I've been holding on to "just because" or "just in case," tasks I'd taken on because I felt like I had to, etc. Cutting down on physical clutter can also sometimes mean getting rid of emotional or mental clutter as well. Try setting a timer. If you have trouble staying on task or are spending too much time dawdling over items, set a timer for 5, 10, 20 minutes, whatever is appropriate for what you're doing. Setting a timer can keep you on task and help you keep in mind how much time you've set aside to work on something. If you have small children, work during nap time or involve them in a child-friendly task. Depending on your kids and their personality, they may be able to help you sort items, organize, or entertain other kiddos while you work. I know, sometimes this is easier said than actually done! Obviously a six month old probably isn't going to be super helpful - just do what you can! If you have younger ones, try working at night or during nap time on bigger projects. If you have older kids, tell them what you're doing and why. Ask them to help recycle or donate items - you can make it educational and fun for them! Enlist help. Maybe you work better as a team. If your spouse is on board, have them help you tackle bigger jobs or get their opinion on what works. Would other family members or friends be willing to help you sort through clothes or dishes? Or perhaps you could ask them to babysit or entertain your kids while you do the sorting. If you have the means, maybe a professional house cleaner or organizer is worth looking in to while you are minimizing. Everyone's situation is different so what works for one family may be totally different for another. Make a list. Lists can be very helpful for some. Try making a list of all the things you want to accomplish - rooms and the things in them you want to get rid of, a list of things to sort through, items & the places you're going to donate them, etc. Above, all remember: it's going to take time! Don't be hard on yourself and don't stress about how much you haven't been able to get done. Celebrate the little victories and try to keep the overall picture in mind. Every little bit helps!